We take a look at The Book of Unwritten Tales 2, the newest point-and-click adventure from KING Art & Nordic Games. If you are like me, your childhood computer gaming experience can be summed up with one word: Sierra. Sierra Entertainment was arguably the king of point and click adventure puzzle games, producing King’s Quest, Space Quest, and even the lesser-known EcoQuest. It was always so exciting to load up the game and know for certain that I would have to think my way through to the end and approach puzzles or problems novel ways. For the longest time, it seemed like these sorts of games were dead and gone, lost to us in favor of twitch streaming and MMOs, but it turns out I just wasn’t looking hard enough. 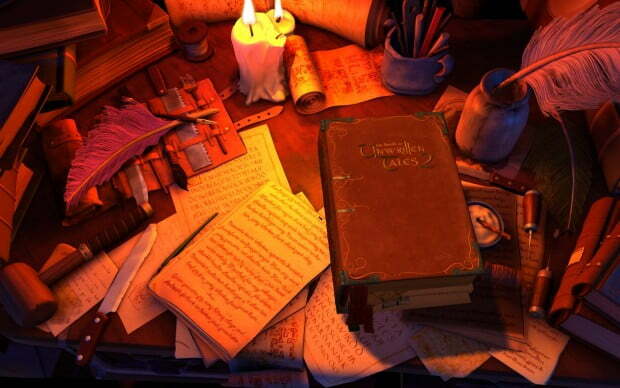 KING Art originally released their own take on this classic genre in 2012, calling it The Book of Unwritten Tales. While I never had to the chance to play the first, l was lucky enough to get my hands on the The Book of Unwritten Tales 2, and I must say, it was truly amazing. The book is an adorable way to start out the game, and it’s also your menu as you play. 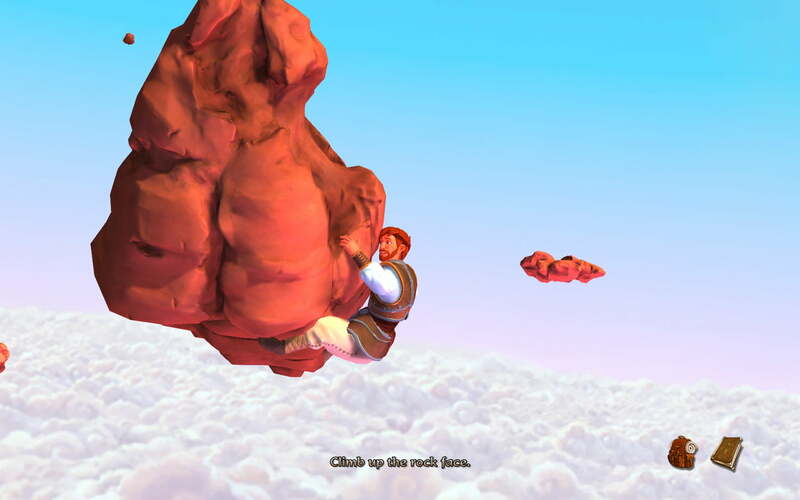 The Book of Unwritten Tales 2 starts by introducing us to one of the main characters, Nate, as he plummets toward both the earth and certain death. Snarky one liners spew from his mouth as you rush to figure out how to save him, and it’s a theme that seems to carry over throughout the entire game. I was able to play with a number of different characters throughout Unwritten Tales 2, but Nate turned out to be my least favorite. His attempt convey a sort of Han Solo/Indiana Jones attitude just left him looking like a jerk. Even when he meets up with Princess Ivo, the supposed love of his life, he still comes across as more of a petulant child than a spurned lover. Each character you encounter has their own story to follow and their own separate reasons for embarking on a journey that eventually brings them all together, and learning what makes them all tick makes the game more enjoyable. Nate and his companion Critter plummet through the air after a botched attempt to steal a magic lamp, Ivo finds herself magically pregnant with no idea how it happened, and Wilbur finds himself trying to teach a class at a school for wizards and witches when everything goes horribly wrong. A wand of unspeakable power falls into the hands of a small, very spoiled little girl boasting an obsession with all things glittery and pink. Before you know it, the entire town she lives in has been transformed into smiling flowers, candy shops, and toys. Though there are many references to the previous game, you can understand the story if you carefully follow all of the dialogue options available during every interaction. This helpful supplement keeps you from feeling alienated if do as I did you jump right into the sequel. Plummeting toward certain death is certainly one way to get my attention! The game is rife with pop culture references which, while fun now, may cause the game to feel a little more dated at time goes on. You have to look carefully to find most of them, but they are everywhere nonetheless . There are Final Fantasy and Minecraft swords in Ivo’s palace library, and even a ‘gather 10 wolf pelts’ quest from a shop merchant in an abandoned town. The game is good at reminding you of your favorite games, while also respectfully poking a bit of fun at them. There’s even a debate Wilbur can have with the shop owner about the skimpily clad female armor versus the male armor. While the male mannequin has ridiculous armor with the typically impractical shoulders, the female model is barely covered by a plate bikini. Eventually, the owner just tells him that he knows better, that he, his dad, and his grandad have been selling armor for years, and that’s the way it is. To be honest, the town this scene took place in was my favorite enviornmnet. It made fun of MMOs in a lighthearted way that most people who’ve played them can agree with, and I found myself actually laughing in response to a number of quips (Wilbur’s naivete did nothing but add to the growing humor in many of his situations). The ending of the game, however, felt cliched and rushed, like an attempt to force an inevitable third game by leaving you with a pretty big hook. While this isn’t always a bad thing, it did leave The Book of Unwritten Tales 2 feeling like a very unfinished story, much like The Fellowship of the Ring. You’re left with no real sense of closure. Poor Wilbur just can’t understand how a poor warrioress would be safe in that get up…and neither can I! The gameplay was much as you’d expect – pick up everything you can get your hands on and carry it around forever until you figure out its purpose. While the tutorial may drag on a bit for anyone who has ever played a Sierra-type puzzle game, I wouldn’t recommend taking it out; there’s enough important information to merit at least a cursory run-through. Veterans will just have to power through with the help of the narrator’s soothing voice. The graphics are over exaggerated and whimsical without being too goofy, and the atmospherics and lighting are simply exquisite. Pair that with a wonderful musical score and lovely voice acting and you’ve got a game that is so well rounded and enjoyable, you’ll find yourself replaying it over and over just to wander through the areas again and listen to the commentary. You’ll even find side quests if you follow all the dialogue options that don’t add to the main storyline. The Book of Unwritten Tales 2 is not only a wonderful homage to the classics we grew up with, but also an inspiring reimagining of the genre that will hopefully breathe some life into this much-loved corner of gaming history. Though the ending wasn’t what I would have wanted, the rest of the game shines so brightly that what would normally be considered a crippling point of contention is merely a mild annoyance. If you want a game you can play at your own pace, that will work your mind more than your reflexes, and with characters so engaging and in-depth that you may find yourself becoming attached to them, then The Book of Unwritten Tales 2 is the game you’ve been searching for. KING Art has taken our nostalgia, cleaned it up, and handed it back to us with a fresh coat of paint so another generation can know what we knew – that games don’t have to be fast or gory to be fun. 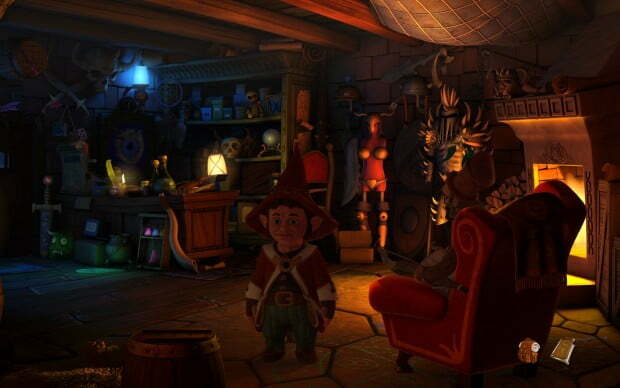 Engaging characters, pop culture references, and humorous dialogue make The Book of Unwritten Tales 2 a wonderful game in its own right, as well as an amazing homage to the games we grew up on. While the game lacks solid closure with the main stroyline, the visually engaging environment more than made up for any shortcomings. Gwynn lives in Beaverton, Oregon under the keen scrutiny of 3 cats with no hope of escape. Her mother handed her a controller before she could read and she never once looked back.